The Platinum Cup Championship was in sight for Jake Eidson as the Porsche GT3 Cup Challenge USA by Yokohama series lined up for Round 14 as a preamble to the Verizon IndyCar Series contest at Sonoma Raceway Sunday. Eidson started from the front of the pack in his No. 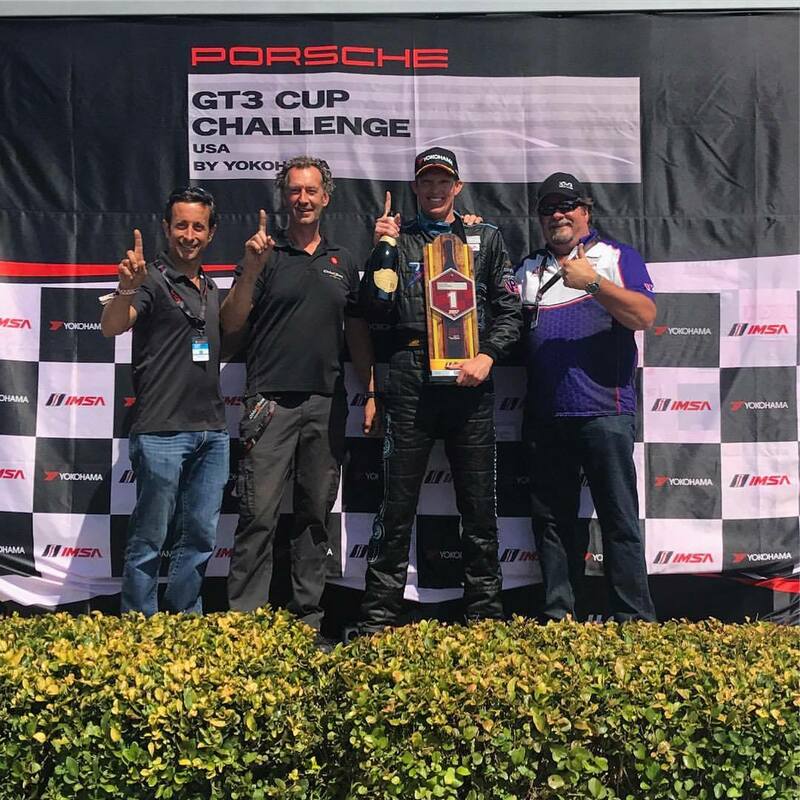 24 Porsche GT3 Platinum Cup car for Kelly-Moss Road and Race and hoped that his familiarity with the 2.385-mile, 12-turn road course would pay off. In a decidedly similar fashion to Saturday, Eidson got on the throttle early and maintained his momentum to post another flag-to-flag win that also sealed the Platinum Cup championship for the IMSA Hurley Haywood GT3 Cup Scholarship winner. With this win, the 2017 Champion now has seven wins, 12 podium finishes, and nine poles on his series resume with only two rounds of competition remaining. Even the most seasoned competitors would acquiesce to the fact that Eidson has been impressively consistent, only finishing off the podium twice this year. Trailing a fraction behind Eidson in championship points, Corey Fergus posted another podium for the weekend with a second-place finish in the No. 00 of Moorespeed/US LED/Byers Imports. Fergus has captured nine podiums and three wins thus far in 2017, but his result was hard won, as Trenton Estep in No. 3 of JDX Racing/Hertz dogged his footsteps throughout the entire race, turning up the heat on the last few laps to battle for position. 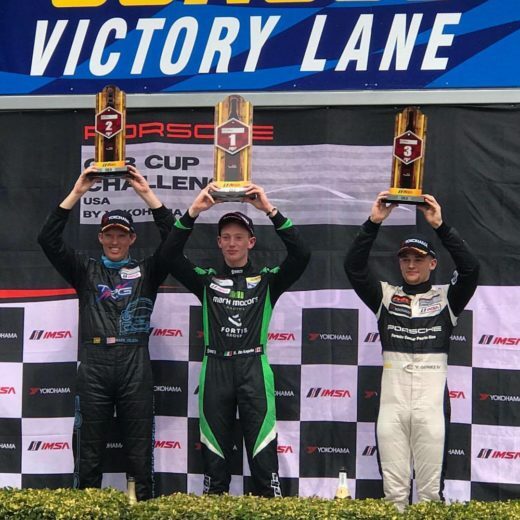 Despite a last-lap challenge, the 16-year-old was unable to overtake, and finished in third place just behind Fergus as the checkered flag signaled the end of the weekend’s competition. In Platinum Masters competition, the dynamic duo of David Baker in the No. 56 TOPP Racing/Apex Capital Corporation entry and Mark Kvamme in his JDX Racing No. 43 hustled to eighth and ninth overall for the one-two finish in class. This was Baker’s first experience with this track, and the team made significant changes to the car after Round 1 in hopes of continuing his streak and edging him closer to the class championship. He leads Kvamme by only 20 points going into the final two rounds at Road Atlanta. 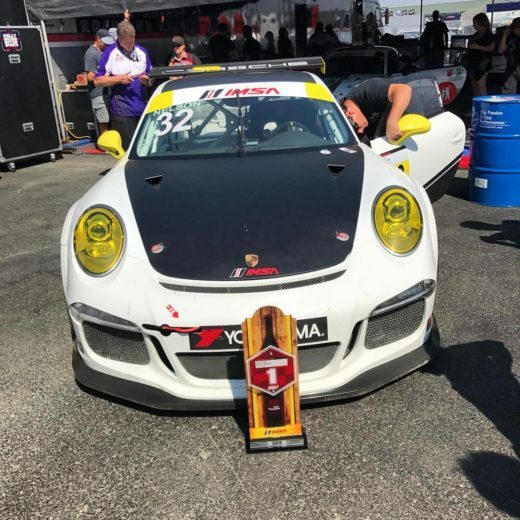 In a bit of a plot twist in the Gold Cup class, Ultra 94 Porsche GT3 Cup Challenge Canada by Yokohama Gold Cup Champion Roman De Angelis suffered an unknown power failure and slowed to a stop on Lap 3, unable to continue and causing the first caution period of the race. His No 78 Mark Motors Racing GT3 Cup car was towed off course and he was forced to retire from the race. De Angelis only led this championship by one point coming into Sunday’s event. With his third-place finish in Gold, Fred Kaimer reclaims the class points lead for his No. 23 NGT Motorsport/Race Deck squad. Series newcomer Mark Nelson used a bit of home-court advantage to seize a win in the No. 32 Kelly-Moss Road and Race/Competition Motorsports entry. 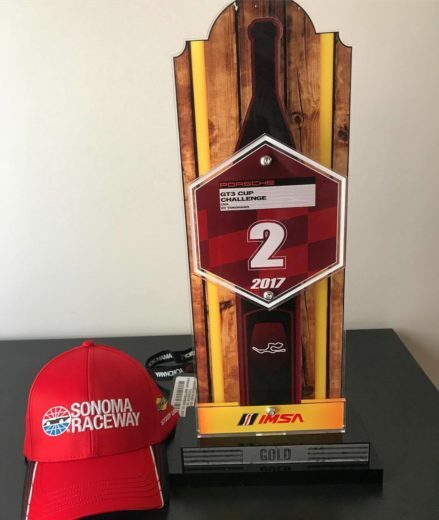 Hailing from Tiburon, California, Nelson claims Sonoma Raceway as his home track and used his experience to garner a win and a second-place finish in Gold Cup competition this weekend in just his first weekend of racing in the series. Victor Gomez IV kept his championship hopes alive with a second-place result in Gold in the No. 25 NGT Motorsport/Mapfre/Porsche Center of Puerto Rico GT3 Cup car. His 11 podiums and three wins this season have pulled him to within two points of De Angelis and eight points away from Kaimer in the class championship. 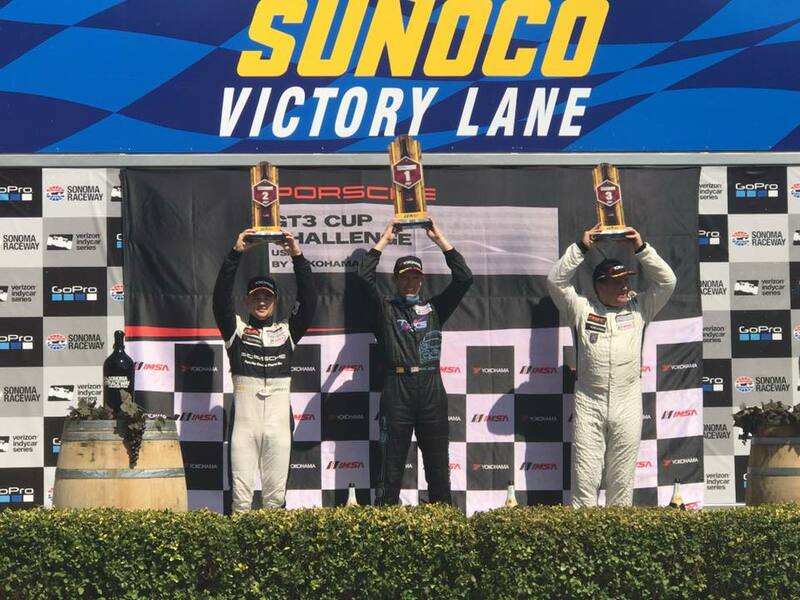 With such a tight points battle among them, the crown will be up for grabs for the trio at Road Atlanta in a few weeks. Bill Smith rounded out the weekend, snatching the Gold Cup Yokohama Hard Charger Award in his No. 42 TOPP Racing/Kung-Fu Saloon entry. Smith was able to improve seven positions in route to the checkered flag. 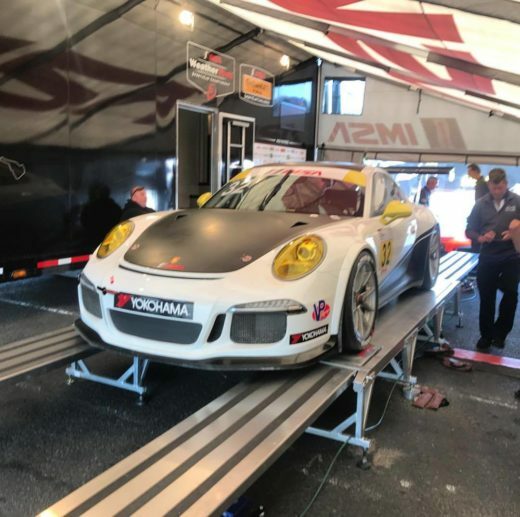 Coming up next for the Porsche GT3 Cup Challenge USA by Yokohama competitors are the final rounds of competition, Races 15 and 16 at Road Atlanta in support of the WeatherTech SportsCar Championship at the Motul Petit Le Mans in Braselton, Georgia, Oct. 4-7. This entry was posted in News on September 17, 2017 by admin.